Damage to the nerves and spine can be devastating for the many people suffering from cervical stenosis. This condition, which causes the narrowing of the spinal canal in the neck, may not present any noticeable symptoms. Any significant signs may develop over time—after severe damage is done. We will look at the possible causes, cervical stenosis symptoms that may arise, and treatments, including exercises you can do at home. What is spinal stenosis in the neck? Open spaces in the vertebrae of our spinal column form what is called the spinal canal. Within the canal lies a group of nerves that form our spinal cord. This is what allows us to move, experience sensations, and control body functions. When the spinal canal in the neck narrows from an external source, it is known as cervical stenosis. 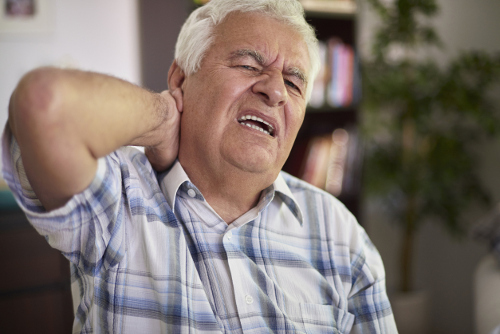 What Causes Spinal Stenosis in the Neck? Cervical stenosis causes can be linked to the aging process as well as conditions that narrow the spine. For a small majority of the cases, a narrow spinal canal results from its development in utero. As we age, our spinal canal can take various forms and shapes as a result of bulging discs, thickening of the tissue, deteriorating cartilage, and overgrowth of joint bones. These sources of narrowing of the canal can be seen after the age of 50. With Paget ’s disease, patients may have spinal narrowing due to bone overgrowth. More common signs are seen with bone spurs as an effect of osteoarthritis. When the discs between our vertebrae begin to wear and dry, they can crack and compress the nerves or spinal cord. Our spinal ligaments, the connective tissue that holds the bones together, can force the spinal canal to narrow. They gradually swell as they thicken and harden. Cervical stenosis can occur when small-growth tumors appear between the vertebrae and spinal cord or on the membranes. A blunt, direct force to the spine can cause a portion of the spinal canal to narrow if a dislodged or broken bone pushes into the canal. Trauma from an auto accident or hit may also cause inflammation of the tissue, which may reduce the canal. Most cases of cervical stenosis do not offer symptoms and are only discovered by imaging tests. Spinal stenosis in neck symptoms may be present when there is a compression of the nerves or spine cord. As time progresses, symptoms that may appear include pain, numbness, weakness, or stiffness in the neck and shoulders region. These sensations may also spread to the arms, hands, and legs. A person’s balance may also be affected, causing issues with walking. Acute damage from cervical stenosis can also affect bladder and bowel control and cause incontinence. The use of electromagnetic radiation to take images of the spinal canal will help uncover any possible changes to the bones. MRI is the preferred choice of many medical professionals when it comes to spinal tests as it will determine if there is any damage to the bones, ligaments, or discs. It also allows for cross-sectional images to be viewed. Images will show any tumors or other compression issues of the nerves and spinal cord. A CT myelogram gives the same effect of a MRI with the signals used in X-rays. A contrast dye is injected beforehand to allow for better imaging of the nerves and spinal cord. With this, a doctor can determine if there are bone spurs, tumors, or a herniated disc causing the cervical stenosis. Once a diagnosis is in place, severity of the cause and symptoms will determine the specific spinal stenosis in neck treatment. Many cases are treated with alternatives to surgery such as pain relievers and physical therapy exercises to maintain function of muscles. Chronic cases may require surgery, in accordance with the underlying cause of the cervical stenosis. Decompressive surgery would release any pressure on the spinal nerves by adjusting or removing tissue, bone, or partial disc. A fusion of the vertebrae may also be needed. Treatment also may be required for complications of cervical stenosis such as long-term loss of sensation and strength in the extremities and possible loss of bowel or bladder control. Any damage to the nervous system from this condition is immediately treated to avoid further impairment. After surgery, and as a therapy itself, exercise is encouraged to maintain use of the muscles and mobility. It is vital to sustain your strength, improve balance and coordination, and maintain spinal movement. Cervical spinal stenosis exercises can be done to help strengthen any weakness associated with the condition as well as maintain mobility of extremities affected. Exercises that cause you to jump, run, and move with jolting actions should be avoided as they can cause more harm. Do moderate aerobic exercises such as walking at a slow, steady pace and swimming. Moving in the water will have less impact on your spine as there is no force causing the movement. You can perform gentle flowing movements in the water while building the muscle strength. Take caution in moving the neck during the water aerobics. As pain can deter us from moving affected regions, it is important to perform range of motion exercises to maintain use of such areas on the body. Simple actions will also help alleviate pain. Avoid a stiff neck by turning the head to one side and holding the position for 10 seconds. Repeat on the other side. Do this slowly and several times throughout the day. Another great neck and spinal exercise is to slowly drop the head forward as if gravity is pulling it down. For a healthy spine, maintaining a good core is key, and it is critical to strengthen it with targeted exercises. Pilates and yoga stretches and exercises are good low-impact choices to strengthen the lower back and abdominal muscles that make up your core. Stretching the spine with bending at the waist movement helps to align the vertebrae. Cervical stenosis can host an array of symptoms that may affect your entire body and hinder your daily activities. In mild cases, a person may not realize the condition exists as no symptoms may be present. Damage to the spine or nerves caused by trauma or the aging process may be directly linked to cervical stenosis. Treatment of the symptoms can bring relief, including surgery to relieve any physical compression of the spinal canal. Maintaining mobility, alleviating pain, and improving strength can be achieved with specialized exercises. “Cervical Spinal Stenosis – Topical Overview,” Web MD; http://www.webmd.com/back-pain/tc/cervical-spinal-stenosis-topic-overview#1, last accessed April 11, 2017. “Spinal Stenosis,” Mayo Clinic; http://www.mayoclinic.org/diseases-conditions/spinal-stenosis/basics/definition/con-20036105, last accessed April 11, 2017. “9 Exercises Lumbar & Cervical Spinal Stenosis,” Brace Ability; https://www.braceability.com/blog/spinal-stenosis-exercises/, last accessed April 11, 2017. Callahan, C., “Exercises for Spinal Stenosis in the Neck,” Livestrong, June 29, 2015; http://www.livestrong.com/article/307085-exercises-for-spinal-stenosis-in-the-neck/, last accessed April 11, 2017.